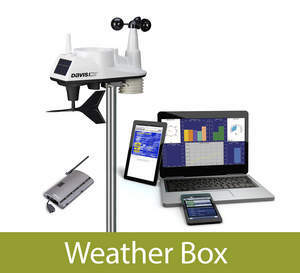 HAYWARD, CA--(Marketwired - Sep 28, 2015) - Just in time for the gift giving season, Davis Instruments is excited to announce Weather Box, an all-in-one bundle for enthusiasts who want easy access to their personal weather data wherever they go. In a few simple steps, customers can install an industry-leading weather sensor suite and, within minutes, view the data on their smartphone or personal computer. Weather Box is a sleek, smart and reliable weather station that will outlast other stations in its class. The solar-powered sensor suite sends updates as frequently as every 2.5 seconds for current weather conditions, including indoor/outdoor temperature and humidity, barometric pressure, wind speed and direction, dew point and rainfall. The data is then automatically uploaded to their page on WeatherLink.com. By downloading the WeatherLink® free mobile app on their smartphone station owners have instant access to weather data and can compare it to other favorite weather stations. "With the Weather Box bundle Davis weather station owners have easy access to their personal weather station data on their mobile devices and the ability to share their weather information over WeatherLink.com. They can view, record and analyze this valuable, archived information for many years," said Atul Chawla, Director of Sales and Marketing at Davis Instruments. With Weather Box, users instantly join an elite global network of nearly 20,000 weather enthusiasts. They can access their data in many different ways: through our WeatherLink mobile app, on WeatherLink.com website or through other industry-leading websites such as Weather Underground. Davis Instruments offers an optional display console for those interested in a dedicated display to view current weather conditions. The list price for Weather Box is $695, but it is being offered for $595 during the holiday season. It includes the Vantage Vue® wireless weather sensor suite, wireless receiver and datalogger, WeatherLink desktop software and free access to the WeatherLink.com network and our mobile app. Weather Box is available internationally via authorized Davis resellers or directly over the Davis website at www.davisnet.com. Davis Instruments is located in Hayward, California, where its research and design, production, technical support, and customer support departments reside. Davis is an ISO 9001 certified company offering full lines of weather, fleet management and marine products. For more information, call (800) 678-3669 or (510) 732-9229. To learn more about the deep heritage of Davis Instruments, visit davisnet.com.